Known as a destination for investment, retirement and vacation, Costa Rica real estate is increasingly attracting overseas house-hunters. From its political stability to its natural beauty, there are many reasons more and more investors want to own real estate here. As one of the most economically and politically stable countries in Latin America, the peaceful country is viewed as a safe bet. It is hard to find another country with Costa Rica’s pace of life, natural splendour, appealing climate and high quality of life, plus its great infrastructure – first-class education and healthcare systems – and wide range of services and amenities. The country is also well known for its amiable and welcoming people who live by the ‘pura vida’ creed. One of Costa Rica’s main draws is its natural beauty and pristine environment. The country is endowed with an intense array of biodiversity and natural attractions – majestic volcanoes, misty cloud forests, stunning river valleys and hundreds of beaches along the Pacific and Caribbean coasts. Costa Rica carries a fascinating ecological story, woven into the history of a peaceful and family-oriented culture. As well, Costa Rica real estate offers great value for money and when considering everything that makes the country what it is, it comes as no surprise that this wonderful land is growing in every way. No wonder that many Costa Ricans, foreign investors and high net worth individuals are increasingly attracted to properties in Costa Rica. Foreign investors have the same right to own real estate as a local does, and title deeds may be obtained for virtually any property that is not part of a government concession. Ownership rights are clearly and legally defined and allow for anyone to hold clear title and ownership. The most sought after properties in Costa Rica are in the Central Valley, the greater metropolitan area of the capital city of San Jose, which includes Escazú and Heredia, where most businesses are, as well as on the Pacific coast. Right in the middle of the nation, the Central Valley is the heart and soul of Costa Rica. About 70% of the country’s population lives in the region, which also includes Alajuela and Cartago. The Central Valley offers an ideal climate, often referred to by Costa Ricans as their “eternal spring”. All in all, the region is attracting a growing number of both North American and European retirees. Escazú is often called the Costa Rican version of Beverly Hills. It is considered by most to be one of the poshest, trendiest and most upscale suburbs of the San José metropolitan area, a place where one will find the best of Costa Rica real estate. Located 12 kilometres from San José, Escazú offers the same amenities and services as the larger and busier city, but with the added advantage of a more laid-back lifestyle. Just like Beverly Hills, there is a never-ending range of boutiques, restaurants, gyms and the exclusive Costa Rica Country Club with its 18-hole championship golf course. One may find it all in this upmarket region. Another rapidly growing district of the Central Valley is Santa Ana. Situated just beyond the trendy Escazú, Santa Ana is ideally situated for professionals working in San José. Santa Ana also hosts a large number of expats who appreciate the local ambience, modern conveniences and cultural atmosphere. Sandy beaches and a rich, protected wildlife are the two primary features of Costa Rica’s Central Pacific region. The long coastline is dotted with beautiful national parks and pristine, palm-fringed beaches, whilst the inland areas encompass large ranches, coffee plantations and forested mountains. Highway 34 stretches along the Pacific Coast and cuts across the amazing landscape with sandy beaches as well as protected nature reserves, including the world-renowned Manuel Antonio National Park, offering an exotic array of flora and fauna. The Central Pacific region offers the ideal setting for surfing, fishing and scuba diving. Popular areas along the shore include Los Sueños, Puntarenas, Jaco Beach, Quepos and the fast-growing beach town of Dominical. The vibrant coastal town of Jaco is a paradise for horseback riding, deep sea fishing, surfing and watersports in general. A bit farther north is Puntarenas, one of the most important regions for tourism, the Gulf of Nicoya and the Nicoya Peninsula, with its amazing coastline and archipelago of stunning islands, inlets and popular beaches, mixed with more secretive shores. Traditionally, Costa Rica attracts retirees from the U.S., Canada and, increasingly, from Europe. A growing number of South Americans are seeking Costa Rica as an alternative place to live. The combination of warm weather, friendly people, natural beauty and a safe, stable government makes it easy to understand why so many foreigners choose to buy Costa Rica real estate, relocate or retire here. Whether one is looking for a luxury vacation home, a retirement home, a villa retreat, or simply investing in Costa Rica real estate for its growth prospects, owning property in this spectacular Central American country can be very rewarding. 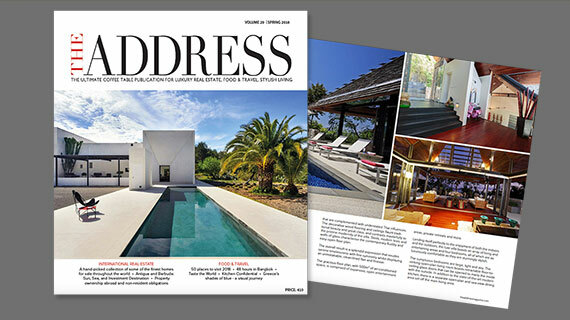 Explore Costa Rica real estate for sale in THE ADDRESS Magazine.